How to unpack the “Invisible Knapsack” in high school. How do you talk about privilege in the classroom? In a lot of schools, the unfortunate answer is: you don’t. But if you’re reading this, you likely have some interest in the topic. You want to expose your students to the concepts and practices of a culture of power, systemic racism, and unacknowledged privilege. And yet. Here’s a series of activities to get the (hard) conversation started. We did them in two days, but they can be managed in one. We started simply enough: “Time to play a game!” Students were already familiar with “where do you stand?” — A statement is presented, and students must move to one side of the room according to whether they agree or disagree. These were adapted from and inspired by Peggy McIntosh’s “Unpacking The Invisible Knapsack,” but we didn’t tell them that. We just told them they were personal statements that would make them think. 2. Ask a meaningful question based on the last few pages of her essay. If you finish this before the time is up, refresh the forum in your browser and you can begin to comment on what other people have written. Before they dive in, I point out that this essay was written in 1988. Do they think that some of these statements might have changed since then? I emphasize that they have the right to disagree with Peggy McIntosh, but that they should be reading to understand, not simply to accept or reject her theory. Why does society avoid the subject of race? If privilege is to be fully realized, should it be eradicated completely? Are their instances in which privilege isn’t harmful? Has she gone out and tested these theories in places where there are less white people and more minorities? Do you think it is truly possible to distress about and admonish a privilege if you fit into the category of people that has that privilege? Did we answer all these questions? Of course not. We barely scratched the surface in the follow-up discussion. But, we got to a place where we could at least start the conversation. The “Where do you stand” activity was essential to setting the stage for this, because it simply illustrates that everyone is a participant in this complicated system of privilege–but also that your role goes beyond the simple binary of being a victim or a beneficiary, the oppressor or the oppressed. Another key is to give students adequate space to approach the essay on their own terms. Personally, I’m 100% aligned with McIntosh, even if I think some her items on the list are a bit outdated. However, I avoided trumpeting this viewpoint in class, for fear of cultivating that accept/reject mindset among students who would possibly be facing a major paradigm shift as a result of the reading. 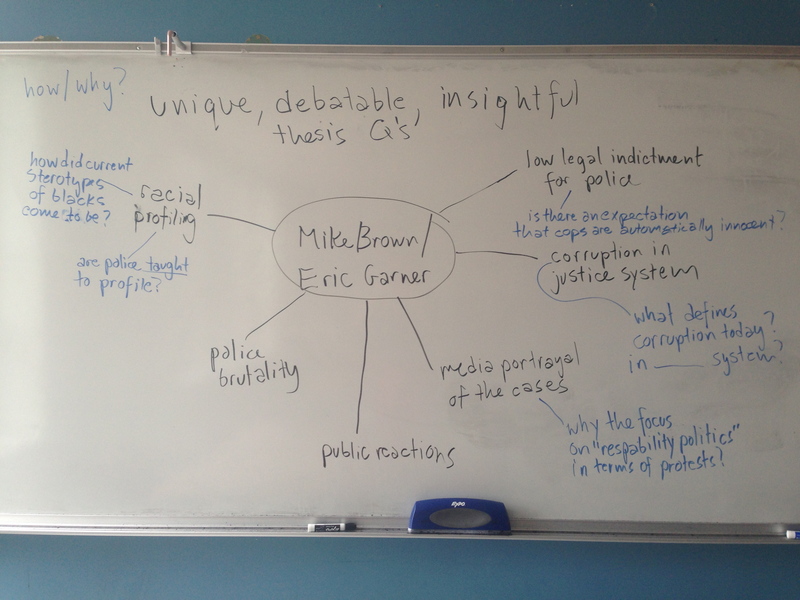 The downside: I had to trust that students who needed reassurance that I actually believe this stuff would intuit that from the fact that I chose to teach the essay in the fist place. You may want to choose differently. So, there you have it. We read this in conjunction with the student book clubs for “Passing” and “Their Eyes Were Watching God.” You probably already have an idea of what text or theme you could connect it to. This seems as good as any to mention that I’ll be co-moderating the #wellrED book club with Zac Chase and Jose Vilson. We’re (re)reading Lisa Delpit’s Other People’s Children – join us on Gooreads! 1. Working at a diverse public school in Philadelphia, my students come from a wide range of backgrounds, which naturally leads to a multitude of responses to the prompts. In a more homogenous setting, student responses to these slides might not make as much room for student sharing, but would still serve as conversation starters: Why is there nobody on that side of the room? Who do we know that does belong there? Why aren’t they represented in our classroom? This entry was posted in Curriculum, Uncategorized and tagged multiculturalism, peggy mcintosh, unpacking the invisible knapsack, white privilege on March 16, 2014 by lpahomov. 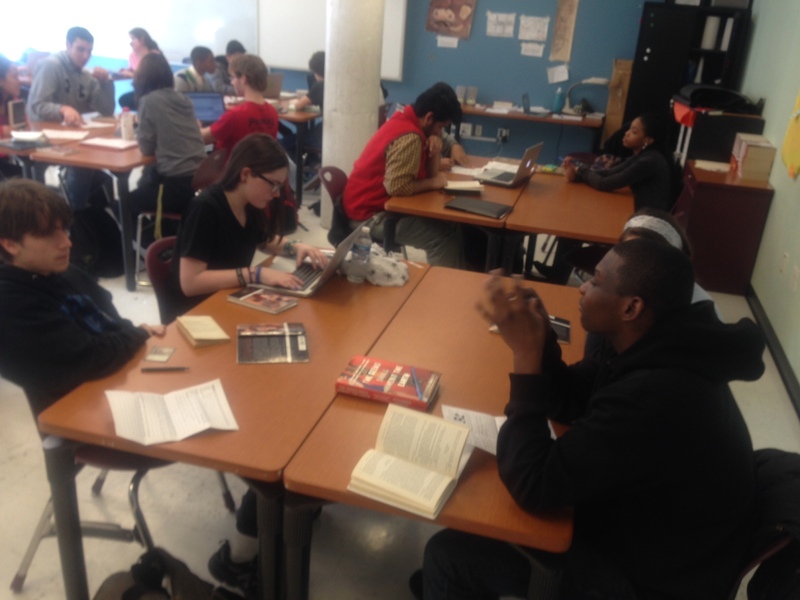 To those ends, we decided to give our students fewer choices than you would for a typical book club. They could read either “Their Eyes Were Watching God” by Zora Neale Hurston, or “Passing” by Nella Larsen. Both were required titles in last year’s curriculum. We gave them time in class to physically browse both titles, and then wrote down who picked what in order to place them in groups of four. The next day, we revealed the groupings and then gave them the basic instructions.. Click on the role titles for the job sheets. Welcome to your Book Club! You club will be meeting twice a week: on Mondays and Wednesdays. There will be seven meetings starting Thursday, Feb. 20th (one time only) and ending Wednesday, March 12. 1. Decide on your page assignment before you meet. If the readings were divided evenly, Passing would read 19 pages between meetings, and Their Eyes Were Watching God would read 27 pages between meetings. Keep this in mind when making your schedule! Questioner, Note-Taker, Clarifier, and Connector. If your group has fewer than 4 people, make sure you have a questioner and note-taker, they’re required! If your group has more than 4 people, you can double up on clarifier and/or connector. 1. Fill your role, but mix it up too. Book club will run at least 20 minutes each time you meet. Don’t just go around in a circle and spend 5 minutes on each role. A good group contributes spontaneously and comes up with new ideas on the spot! 2. Play devil’s advocate when needed. If everybody is agreeing, don’t be afraid to try out the opposing viewpoint. You never know where it might take you! 3. Cooperate. It’s a club, not a war! 1. You must play each role at least once. Once you have tried every role, you may repeat. 2. You may do independent reading alongside your book club book. The assigned reading may not get you to 30min/night 5x a week. Just make sure you get your book club reading done first! We will still have reading journals, so you can tell us about either book in the journal. 3. If you’re struggling, read with a partner! Read out loud to each other, review before class. And try listening to the audio as well — both are posted on canvas. 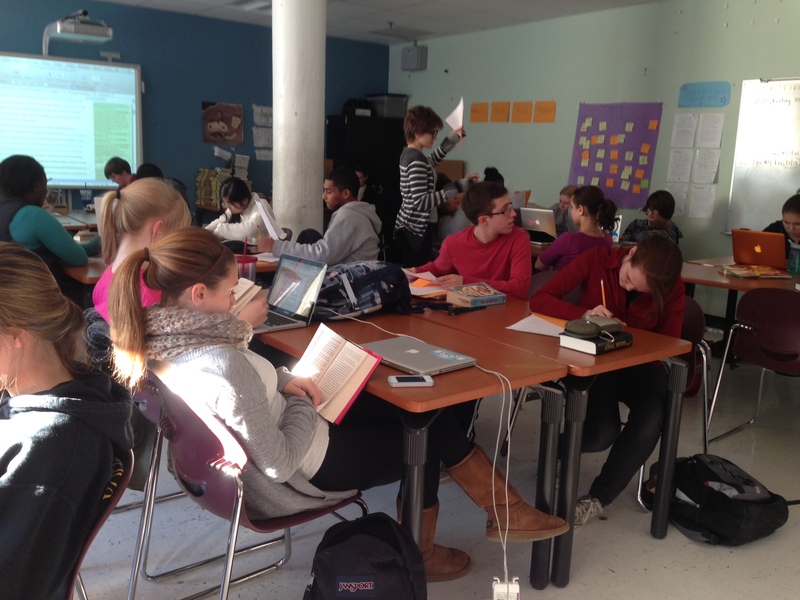 Book clubs are a common practice, including at SLA, and I take zero credit for any of these ideas. Our resident book club expert is Alexa Dunn — everybody who adopts the practice goes to her for materials and advice! After consulting with her and Matt Kay, I figured out a way for book clubs to work in my independent reading setting. More on how it went in a later post. This entry was posted in Curriculum, SLA, Unit Plan and tagged Book Club on March 9, 2014 by lpahomov. Sometime last summer, I decided to set my sophomore English students free. Well, that’s not entirely true–it started earlier than that. Heather Hurst put the thought in my head last year, when I got to read her dissertation based on research in my classroom and it blew my mind a little bit. She had already used a workshop model back when she was a classroom teacher, which made it seem less impossible to me. And then I spent a couple of weeks communing with Nancie Atwell’s “In The MIddle,” which, as Lehmann put it to me sometime this fall, is the book that everybody reads in graduate school, thinks it has great ideas, and then shelves it in favor of a more traditional approach. This is going to be a grand experiment that we embark on together. This year, you will read what inspires you and write about what moves you. …But you are in charge of your own learning and improving as a writer and reader. Constant Check-ins = more feedback and help when you are learning, instead of when the project’s done. Of course, I meant to blog our progress starting in September… but now, in January, I’m happy to report that we are still living in (and loving) reading writing workshop. If you had told me even two years ago that I would be doing this, I would have unequivocally responded: you are crazy. And yet, here we are. Students participate in independent reading full time. They contribute pieces of writing to their portfolio each quarter, and they decide what genres and topics to tackle. I get to give more individualized, formative feedback that students actually use. More than ever before, I can say that I really know my kids. A whole group of us will be talking about this “grand experiment” during our EduCon Session this coming Sunday, January 26th at 10:30 AM Eastern. We encourage you to join us in person, if you are attending live, or via the live stream that will go out via the website. Feel free to send us your thoughts in advance, via this site or the EduCon write up. Or just show up and join in the conversation! This entry was posted in Curriculum, EduCon, SLA, Unit Plan on January 22, 2014 by lpahomov.